HiltonHead.com » Pickleball Revolution: What is Pickleball? Pickleball Revolution: What is Pickleball? I understand these sentiments, being a fully addicted “tennisholic” for most of my adult life, but the attraction of this game goes well beyond the feeble and the unable. Those that look beyond the edge of their nose and venture out on our courts to give the game a try, quickly discern that pickleball is easy to learn, very social, much more aerobic than they thought and FUN, FUN, FUN! Pickleball is not a replacement for tennis. In fact, I bristle when people say that it’s tennis-like. It is more akin to playing ping-pong standing on the table than anything I’ve ever played. Who in their right mind could imagine that such a game could be anything but fun? Come take one of our clinics today and join the revolution! 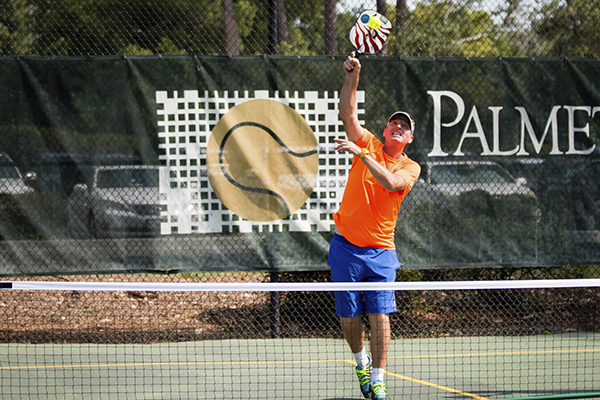 To learn more about Pickleball offerings at the Palmetto Dunes Oceanfront Resort or to better your game with a clinic or lesson, contact Head Pickleball Pro Mark Anders at (866) 242-3169 or visit palmettodunes.com. Complimentary tennis activities at the resort include a Monday Night Welcome Exhibition at 5:30 p.m. and Demo Days on Tuesdays at 2 p.m.